THE various institutions of the Dervishes (Sufi) are established upon different principles. Each founder gave a distinctive character to his sect, by the statues, regulations, and practices, which he appointed. The differences, which we may remark in them, extend even to their dress. Each order has its particular costume; and in most of them we may observe a difference even between the Dervishes and their Schiekhs, or superiors, particularly their turbans, the form of their dress, the colour and nature of the stuff of which it is made. 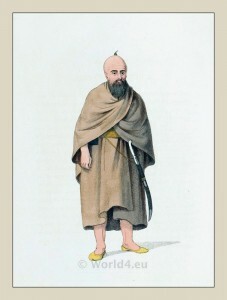 The Schiekhs generally wear a robe of white or green cloth, while very few Derwishes are permitted ever to wear cloth. A species of felt, called aba, which is manufactured in some of the towns of Anatolia, is the usual material of their dress. Those, among the Dervishes, who are most actuated by zeal. voluntarily undergo the most austere acts. In order to prevent their falling asleep, some of them will sit during the whole night in the most inconvenient and irksome positions. They will often sit with their knees and hands fastened by a leathern strap round their neck as close up to their face as possible. Others will tie their turf of hair by a cord to the ceiling, so that they cannot lie down. This plate represents the form of their hair.